The CCC-CSU teacher preparation framework was recently completed by the California Community College (CCC) Teacher Preparation Programs (TPP) in collaboration with the California State University (CSU) system Department of Educator Preparation and Public School Programs. Select the link for a copy of the collaboration letter. Senate Bill (SB) 577 was approved by the Governor and chaptered on September 20, 2018. This legislation establishes the California Community College Teacher Credentialing Partnership Pilot Program under which three grants of up to $500,000 would be funded for the purpose of offering accredited teacher credential coursework remotely at a participating community college or colleges in partnership with a teacher preparation program. Following is the link to the chaptered legislation: Chapter 603, Statutes of 2018. The May newsletter TakeNote from the California Community Colleges Chancellor’s Office looks at exciting changes and trends occurring in the career education/career technical education field. The May report details Chancellor Oakley’s commitment to equity, student success and the need to provide community college districts with the time to transition to the newly proposed funding model. Read the report here. The California Community Colleges Chancellor’s Office, Workforce and Economic Development Division announces the Education Futures awards for teacher preparation programs, anticipated to total $3.52 million over two years, pending first year performance. The Chancellor’s Office received 44 applications and 23 colleges were funded: nine Regional Model Grants, six Development Grants, and eight Incubator Grants. Grant applications were reviewed and competitively scored. Regions with clear support for the development of teacher preparation programs were prioritized, and funds were awarded within those regions based on reviewer scores and applicant grant levels (Regional Model and Lead, Regional Model, Development, and Incubator). This one-time funding supports regional efforts to scale up teacher preparation programs in order to maximize our impact on expanding and diversifying the teacher workforce. 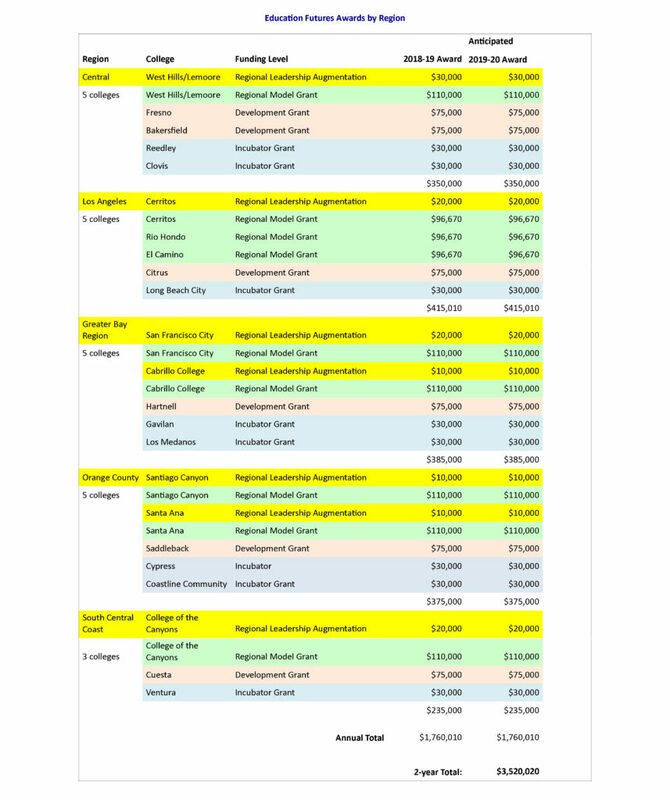 Where regional Strong Workforce leadership prioritized this work, and where teacher preparation leadership and local capacity are strongest, these funds incentivize the use of local resources to expand services while encouraging teacher preparation integration into the core operations of the college. Regional teacher preparation program communities of practice developed through this initiative will align Community College education pathways with key partners from K12, CSUs, and other Institutions of Higher Education. The Education Futures program supports regional efforts to align systems, develop infrastructure, and disseminate resources needed for colleges to grow their own teacher preparation programs. Guiding students from across all pathways toward teaching professions is fundamental to our mission as educators, and of crucial importance to the education system in California. California’s students will benefit tremendously as we expand clear education pathways across systems and diversify student populations entering teaching professions.